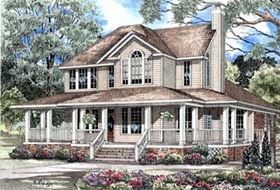 A wraparound porch shades the windows of the main living areas and extends entertaining space outdoors. The breakfast area leads into the sunroom, which features a corner fireplace, perfect for entertaining year round. The upper-level game room is also perfect for play. This home is designed with basement, slab, and crawlspace foundation options.